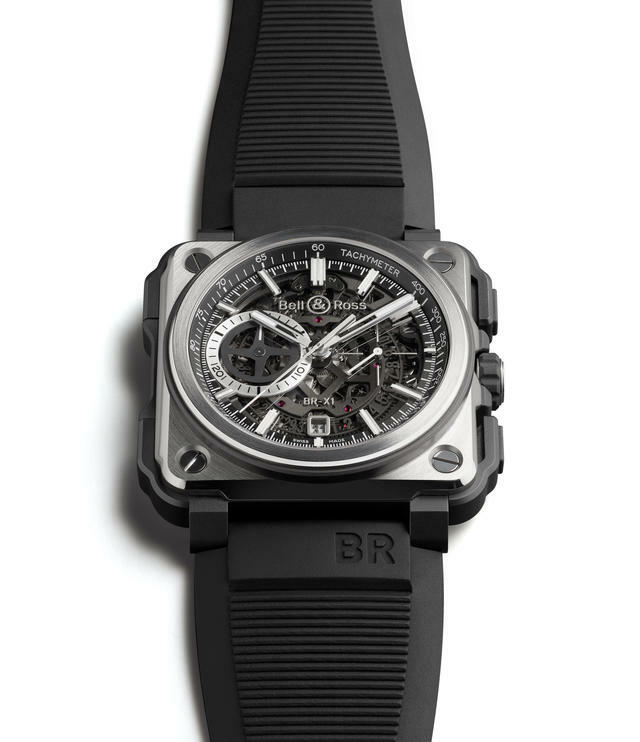 Originally launched three years ago, Bell & Ross’s BR-X1 Chronograph was called an “extreme version of the BR-01, whose iconic square shape is directly inspired by aeronautical flight instruments.” The X in the watch’s name was linked for marketing purposes to the Bell X-1, first American experimental rocket plane to break the sound barrier when in 1947 it sped at Mach 1, or 1,224 kilometers per hour. The X is in fact the code letter that refers to NASA’s experimental projects. The series effectively added a contemporary flair to Bell & Ross’s wildly popular 45mm square chronograph design. Since that debut, Bell & Ross has utilized this square, skeletonized design in numerous limited editions, many of which feature artfully colored components, of varying metals, that add extra three-dimensional panache to an already multi-level open worked watch. One particularly handsome example features a wood and titanium case and bezel. Bell & Ross several years ago also added a tourbillon to the design to develop a series of extravagant high-end models with unusual cases. 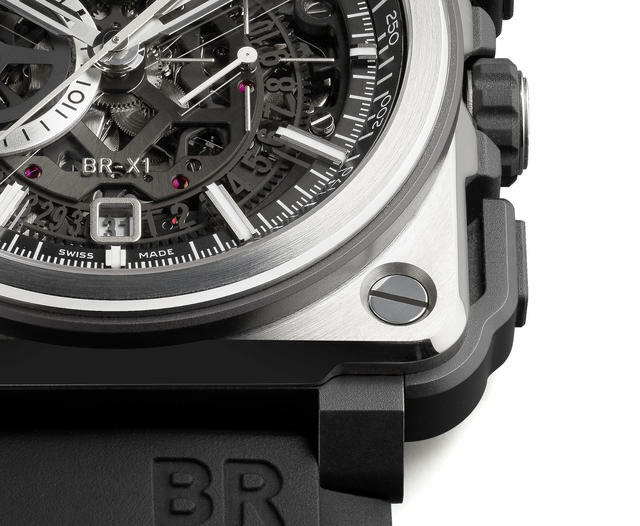 These include the BR-XI Tourbillon Sapphire and the BR-X1 Tourbillon Chronograph Carbon Forge, among others. 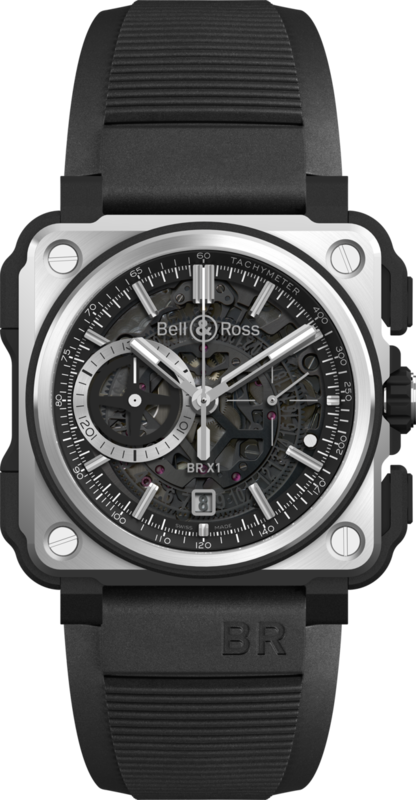 This week Bell & Ross releases the BR-X1 Black Titanium Chronograph, the latest BR-X1 iteration initially seen at Baselworld 2017. Not surprisingly the new watch echoes the previously debuted BR-X1 Titanium Chronograph, but darkens the internal bezel, left-side grip and rubber inserts, which are red on that earlier edition. This watch’s square titanium case retains the complex design of the ceramic and rubber protective cover and its rocker-style easy-to-grip rubber pushers and grip (at 9 o’clock). 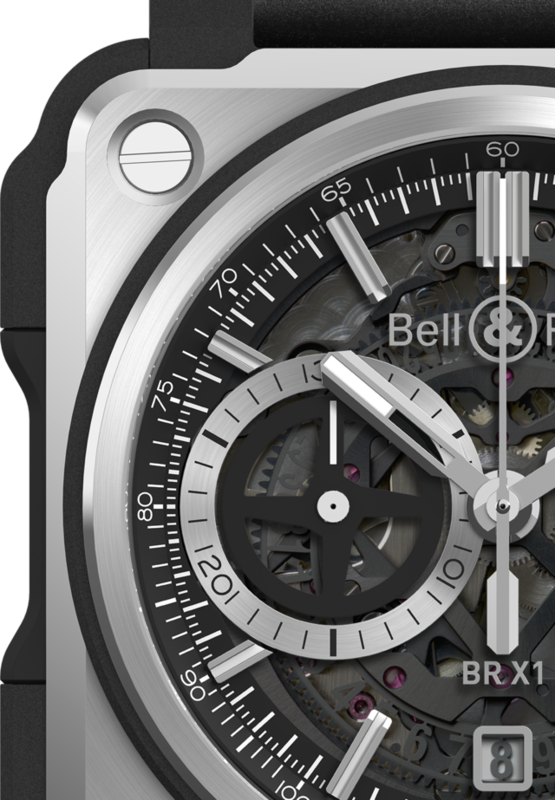 Bell & Ross again utilizes its expertly open-worked BR-CAL.313 automatic movement (created from an ETA 2894-2) that features an x-shaped upper bridge. Bell & Ross will make 250 examples, each priced at $18,600. Movement: Caliber BR-CAL.313 (skeletonized from an ETA-base) automatic mechanical chronograph with 'X'-shaped upper bridge. 56 jewels, 28,800 vph. Case: 45 mm in diameter. Titanium and ceramic with rubber inserts. Rocker push buttons. Back with opening in tinted sapphire crystal, centered on the balance; 100 meters of water resistance. Functions: Hours, minutes, small seconds at 3 o'clock, skeleton date at 6 o'clock. Chronograph: 30-min timer at 9 o'clock, central chronograph seconds. Dial: Grey-tinted sapphire crystal with metal applique SuperLuminova-filled indices. Metal skeleton SuperLuminova-filled hour and minute hands. Bell & Ross’ iconic instrument panel-inspired look adapts well to the skeletonized façade with a smoked glass dial and monochromatic black and silver/grey effect. Levered chronograph pushers and a technical multi-part case combine titanium, ceramic and rubber. Thirty minute chronograph limits long-term timing. Circular graining and anodized elements within the case are better than average for an “instrument” or “tool” type wristwatch. Good lume application with full size hands for the time and an oversized elapsed time (chronograph) sub-dial are both easy to read at a glance. High initial pricing of $18,600 somewhat moderated by rarity (250 will be made).